Racks are designed to hold up to 12 rolls of 10' wide reinforced vinyl floor covering fabric. It features state-of-the-art locking castors with broader floor contact for better weight distribution, manual winder standard or optional power winder with adapter chuck (110 volt). Roller bearings in the swivel casters allow easy movement of a fully loaded rack by just 2 people, and they can easily deploy and rewind the floor covering segments in minutes. Racks measure 34" wide by 11'-3.5" long by 67" tall when assembled. The load rate of your flooring system (in psi) should always be allowed for when choosing gym floor cover fabric weight, # of panels per rack, type, style and number of racks, and ultimately the pounds per square inch of force exerted on your floor by the fully loaded rack(s)"
When the gym floor cover weight exceeds 10 panels or a total of 1350#'s the Deluxe Rack should be specified...The Deluxe rack is made from a heavier gauge of steel...both styles of racks offer our exclusive "no-mar" wide tread locking casters for better weight distribution and floor protection. Available in 5, 6, 7, 8, 9, 10, 11 and 12 roll capacity. Two capacity widths available either for 10' wide or 15' wide sections. 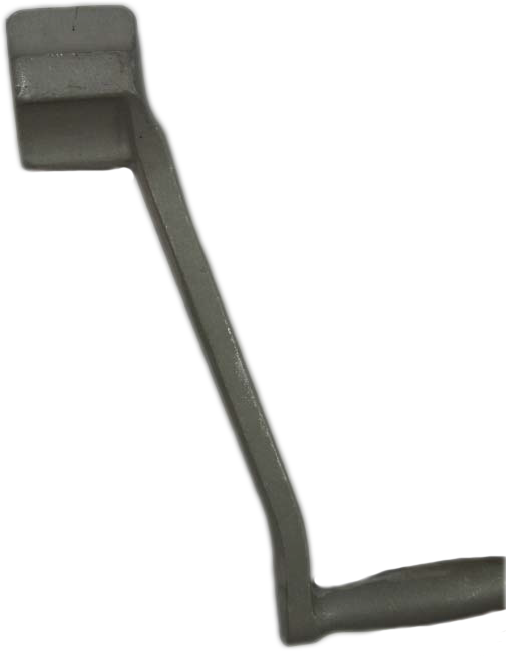 Adjustable bar brackets allows for larger/smaller diameter sections. Add brackets/bars depending on need. One wrap Velcro keeps the floor cover from unraveling. 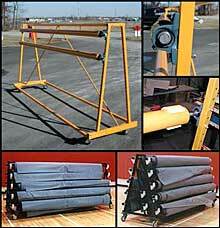 Non-marring casters for easy rolling even with heavy loads. Four swivel locking casters for easy maneuvering and safety. 34" wide to fit through standard doorway of 36". Optional adaptor and power rewind system. 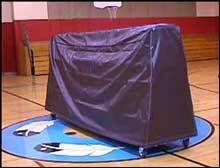 FOR PROPER WEIGHT DISTIBUTION AND SAFETY when loading/unloading the rack, evenly distribute the weight of rolled gym floor covers. Load from the bottom up alternately from side to side and front to back. Unload the rack following the same procedure in reverse top to bottom.